Lack of regulation and surveillance coupled with misuse of antibiotics are driving the rise in antimicrobial resistance, experts from various countries expressed at an international workshop organised by non-profit Centre for Science and Environment (CSE). 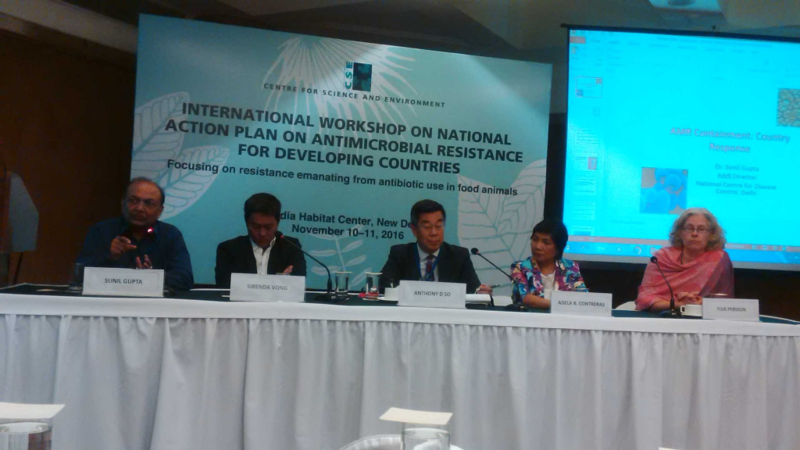 The workshop on “national action plan on antimicrobial resistance for developing countries” is focused on resistance emanating from antibiotic use in food animals. The two-day-long workshop is being held in New Delhi. Antimicrobial resistance (AMR) is the ability of a microbe to resist the effects of medication previously used to treat them. In 2015, the World Health Organization adopted the Global Action Plan on Antimicrobial Resistance. The plan also called for member states to develop a National Action Plan by mid-2017. So far, only 25 countries, most of them developed, have submitted their plans. No plan has been submitted by any country from Southeast Asia and the Eastern Mediterranean region. It is feared that by 2050, antimicrobial resistance will lead to about 10 million deaths every year with an estimated two to three and a half per cent reduction in global gross domestic product. This is likely to cost the world up to US $100 trillion, as per Sirenda Vong, regional technical lead, Department of Health Security and Emergency Response, WHO Southeast Asia regional office. Explaining the scenario in India, Sunil Gupta, additional director, National Centre for Disease Control, said that the country did not have an implementable national action plan. However, eight committees and three advisory groups were formed and the plan would be ready by April-May 2017. CSE’s Deputy Director General Chandra Bhushan said that WHO’s Global Action Plan lacked strong focus on environmental aspect of antimicrobial resistance.“The human side of AMR has been discussed in our part of the world. We believe environmental and animal side deserve increased focus because they are not adequately captured in the Global Action Plan,” he added. Pointing to the CSE studies which highlight large use of antibiotics in food animals and honey, Chandra Bhushan said there was an unregulated availability of antibiotics in the market. A huge economic interest was being created for continued use of antibiotics. Release of residues from pharmaceutical industry, animal farms and processing units was a huge problem, he added. “The focus on environmental aspect of AMR was weak. We are doing this workshop because we think many plans being developed by countries do not focus on environmental aspect of AMR,” said Chandra Bhushan, deputy director general, CSE. India lacks regulation for veterinary drugs and there are patchy studies to understand the issue of antimicrobial resistance in the country. Lack of adequate infrastructure was also highlighted at the workshop as a challenge. CSE’s Director General Sunita Narain said that the workshop was aimed at mutual learning and taking inspiration from good practices being followed by other countries to come up with innovative and far-sighted ways to tackle the issue. “We cannot be a country that uses huge amount of antibiotics and then worry about how to clean up. Hence, we need to leap frog,” said Narain.